On the same plant, the staghorn fern has two kinds of fronds--shield fronds, which are flat and sterile, and longer fronds that are fertile and look like the horns of a stag. The shield fronds adhere to the fern’s growing surface. As an epiphyte in its native tropical areas such as Madagascar, the staghorn grows on other plants for its support and shuns soil. Many people mount staghorn ferns on attractive pieces of driftwood and other objects, but the fern can outgrow its available space. That’s a good time to take it off its support, and divide and transplant the pieces. Identify the shield fronds on your fern; they are the flatter fronds. When the oldest shield fronds turn papery and brown, that’s a good time to separate and transplant your fern, according to the "Houston Chronicle." Unmount or unpot your fern. Do this as gently as possible to avoid damaging the rhizomes that are developing under the older shield fronds. 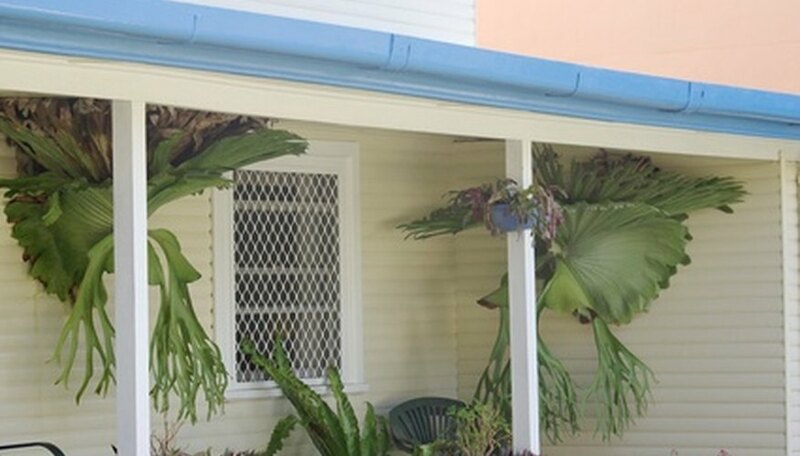 Examine your staghorn fern to determine where you should cut it to divide it. If you see natural divisions between fronds, cut in those areas. Using a clean, sharp knife, cut through the brown shield fronds and then cut off a grouping of fronds, making sure you cleanly cut through all the rhizomes and roots. Soak the divided pieces of your staghorn fern in a solution of Vitamin B-1 or other growth-enhancing product designed to reduce transplant shock. Mix the product with water according to label instructions and then leave the fern clumps in the solution for 30 to 60 minutes. Remount or repot your new ferns using fresh sphagnum moss or another nonsoil medium. Soak your moss for three or four hours and then attach it to the growing surface by tying it or driving nails to support it. Then tuck your staghorn fern clump into the damp moss, making certain that the tips of its fronds will point upward when you hang the fern and its mounting board. Water your new ferns immediately by pouring water over the moss several times. Follow this practice when you water your fern every few days after you transplant it. Staghorn ferns benefit from a daily misting of water to keep their environment more humid. It's best to divide your staghorn fern into several larger plants instead of many smaller plants, according to fern expert Mike Lowery of Another Place in Time garden shop in Houston, Texas. "Houston Chronicle": How To Divide My Gigantic Staghorn Fern?